It was HOOT AND HOLLER? I AM JUST AS CONFUSED AS YOU! 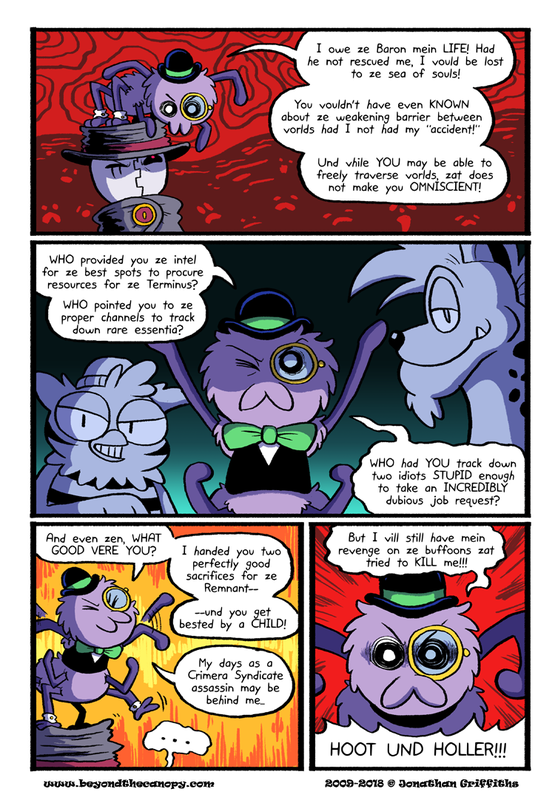 With info from the BTC patreon and some archive diving, I think what this means is that Hoot and Holler are Horatio’s reason for continuing to work with the baron. They did something bad to Horatio, so in return he had Shambles hire them to track down the remnant/be sacrificed to it (see page 100). Hm, that is the rational explanation. However what I mean is that they were responsible for Horatio’s “accident”, thus leading to Shambles and the Baron finding out about the weakening barrier between life and death, thus plotting the invasion. Oh man, you’re right! That’s… an interesting development?? I’d just like to say that I am very happy about Omniscient being used instead of Omnipotent. It means a lot. That hat is gonna get ruined. Lets hope it wasnt 9000000 dollars! I don’t wanna pay for it.